Get a different perspective of Buenos Aires during this 2-hour lunch cruise on the Rio de la Plata. 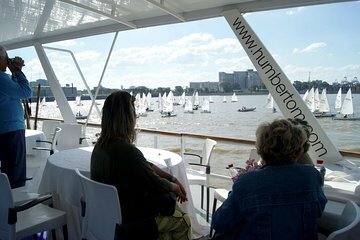 Board the 'Humberto M' in Puerto Madero and set sail up the city's coastline. See the bustling Buenos Aires Port, the Argentine Yacht Club and the Fishermen Club. Witness seagoing vessels of all shapes and sizes as you dine on a delectable lunch. Learn about the history of the river and the port from your guide as you sail. Round-trip transportation from Buenos Aires hotels is included. Children 4 years and under free for Navigation and Lunch - only pay transportation. From the pickup at our hotel to the drop off there, this tour was excellent. The boat offered seating at tables or benches on the deck and had a lovely bar and dining room below with large windows to allow a perfect view. The tour of the river went away from Puerto Madera towards the airport and past the cruise ships and yacht club. The lunch served had several options to choose from, included dessert and was very good. Drinks were extra but very reasonable. Recommend this for a delightful afternoon in BA. Ensure you request to be seated first for the meal, we were second last and the food was rushed out over a small period of time. Quality of food could be improved and even reduced in size to accommodate for better food options. I would have preferred authentic Argentinian cuisine options at time of booking. Muy buen paseo! Sin duda que es diferente a todo lo que se conoce ya que nadie muestra a Buenos Aires desde el Rio de la Plata! El servicio muy bueno pero la comida no tanto para el precio que costo... y los postres ni siquiera estaban en las cartas que nos fueron entregadas para elegir la comida. A pesar de eso no me arrepiento de haber tomado el paseo con mi seniora y mi hijo!!! Gracias.